Last month the Hulu adaptation of The Handmaid’s Tale won pretty much every Emmy under the sun, which is extra proof (as if it needed it) of its standing as a haunting, powerful, timely show. While I loved the series, I also read the novel for the first time last year, and while watching I couldn’t help but compare the two tellings of the tale as they were both so fresh in my mind. For all their obvious similarities, book and TV show are decidedly different pieces of social commentary. I’m going to explore why, how they differ, and see if there’s a decisive answer to the question: which one is best? Spoiler warning: this will ruin the first season of The Handmaid’s Tale for you, so don’t read on unless you’ve watched all ten episodes. I’ll also be covering major plot points from the entirety of the novel, so best not to carry on unless you want that spoiled too — as well as any potential future seasons of the show. 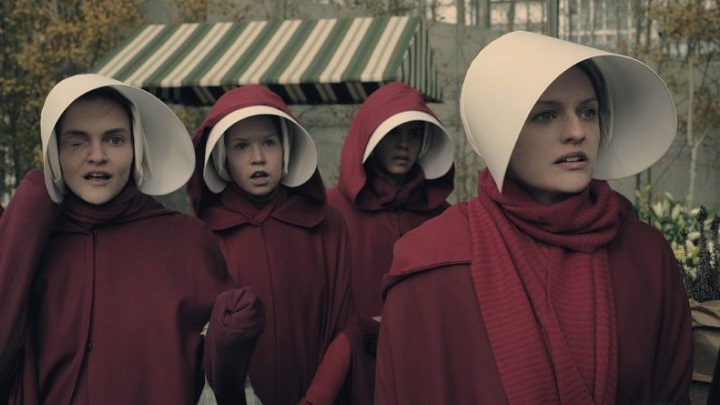 Margaret Atwood wrote The Handmaid’s Tale over thirty years ago, so it’s no surprise that its most recent adaptation has been, well, adapted to suit our modern times. The novel itself envisions a twisted patriarchal society that, particularly from the American viewpoint in which it is anchored, seems both further away and closer than ever compared to when it was written in 1985. The Handmaid’s Tale as a TV show gives us a vision where Tinder exists before the rise of totalitarian state Gilead, where our current social and political climate becomes a staging ground for the events of the series. While the book is still just as chilling today as when it was written, the show does benefit from these updates that ground the story more credibly and terrifyingly in the world we already recognise around us. If there’s one area where the show got flack, it was its depiction of race in this hauntingly modern Gilead. Somehow, unconvincingly, race is a non-issue in the regime that seems to have no problem suppressing women. By making race irrelevant in Gilead — the extrapolated state of all our current sins — The Handmaid’s Tale seems to be saying that race is irrelevant also in our current society. And it clearly isn’t. Perhaps the creators of the show felt they had enough on their plate dealing with feminist issues that they didn’t want to heap race issues on as well, but it does feel like something of a glaring oversight in a series that is otherwise constantly trying to show us how such a future could blossom from the present we live in right now. In the book race is mentioned only to a small extent, but in a much more realistic and painful way. None of the main characters are black, unlike in the TV show, and it’s explained that the rulers of Gilead have marginalised and relocated several minorities including African-Americans and Jews. There is one major strength of the television adaptation in this regard: it gives black characters a voice and an impact on the future of Gilead, rather than shuffling them silently to the sidelines, as occurs in the novel. The Handmaid’s Tale as a book is thick with an atmosphere of oppression and claustrophobia. Nothing is known. Everything is uncertain. Offred wades through her trapped existence like a thick fog, struggling to work out what’s real and what’s not. The TV show is quite notably different. It tries to emulate such an environment — and goes a long way towards conjuring those feelings of terror, stress and confusion — but ultimately fails to achieve what the novel does. This is because it’s told through multiple objective viewpoints. In the book there is never any escape from Gilead, just as there is never any escape from the confines of Offred’s own perceptions. There is no time for quick filler episodes in Canada — this is a repressed, regulated regime where nothing gets in or out. We don’t see what happens to Luke or Moira. We don’t see the former fighting to see Offred or the latter seizing her hard-earned freedom. We, in fact, never learn about their fates at all. We only see the inside of the commander’s house, the grocery store, the walk along the drive, and all the despair that comes with it. In the TV show however we flit from person to person, viewpoint to viewpoint. While this does give us enticing glimpses into other elements of and people within Gilead apart from just what Offred sees and hears — I’m thinking mainly of Serena Joy’s backstory — it also gives us a chance to anchor ourselves, to establish relative truths, to escape from the oppression even momentarily. Ultimately, it’s a less hopeless approach. It’s possible the creators of the adaptation thought Atwood’s original pitches itself as too depressing; perhaps, in the times we live in, they knew we were clamouring for something more positive. As a novel The Handmaid’s Tale is given incredible power through the single lone voice of Offred. We second guess ourselves, just as she does. We grapple with whether it’s dangerous to fight back or dangerous to not, just as she does. We are forced to experience everything through her eyes, even as we imagine all that must be occurring around her, the images becoming more incredible and beguiling through the imagining. The message, here, has no chance to become diluted. We really feel trapped along with Offred, alone, confused, with no chance of grasping the truth. But the show gives us access to the world outside of Offred, and in doing so it breaks the magic spell. The things we have imagined collapse into a single verifiable truth — Gilead loses a little more of its power with each piece of information we obtain. The show becomes less about the psychological battle going on in the head of Offred and more about the physical rebellion occurring throughout Gilead. Offred’s true name is never explicitly revealed in the book, unlike in the TV show. That she is even starting to disassociate herself from her name tells us all we need to know about how broken and bowed she is becoming. We can actually deduce Offred’s name — June — from a list of ones she reels off in the first chapter of the book, but she never tells it to us directly, and it’s something a first-time reader is unlikely to pick up on or remember. In the novel almost all facts are hidden like this, like dust in cracks that must be carefully picked out, if they can be at all. Nor do we know the name of Offred’s commander: it is never given because Offred never had need to know it. We only work out that his first name is Fred after the given name Of fred has settled in our minds for a while — this naming convention of the handmaids is never explained as in the show, but simply left to simmer. Offred cannot or will not give us this information, either because she does not have it or because it seems pointless to tell us. The regime takes everything from Offred, including her name, and eventually even the memory of her husband. In the TV show Luke is a somewhat flat character. He can do no wrong and is portrayed as the perfect everyman, kind, loyal, strong and thoughtful. But the book paints a very different picture through Offred’s eyes. She has fond, loving memories of Luke, but they begin to crack under pressure and repeated strain. She begins to question everything she thought she knew, and wonder if, in his heart of hearts, her husband too believed that the changes happening in their world were best for her and for all women. Her memories begin to sour. She starts to forget what Luke was really like, and, uncertain of his fate, why she loved him in the first place. The Handmaid’s Tale novel preys off this cloying uncertainty. It gives us very little closure, even in its final chapter. Offred is whisked away to an unknown future, whether bad or good, freed or tortured, and that is where we are left hanging. The very same thing happens at the end of the show’s season one finale. Gilead doesn’t permit lives to be lived. So perhaps Offred gains some sort of victory by living the rest of her life, however long or short it might be, away from our prying eyes. She gets to write the end of her own story, without fear of mistranslation, censureship or deletion. Except of course season two of The Handmaid’s Tale show has already been announced, so we know it must depart from the novel in this most important aspect. It must go on. It cannot end here, for there are more stories to tell, more drama to whip up, more viewers to entice. The suspense of the finale is somewhat ruined. We can assume June will survive to try and rescue her daughter and escape to Canada. In this way the book was undeniably stronger for its uncertain ending, its total inability to give us the full picture, the meagre snippets of information it forces both us and Offred to live with. We truly do not know how her story ends: we can only hope, and pray, and remain strong, as she does. But the novel doesn’t actually end with that final scene of Offred disappearing into the back of a van. It ends with a wonderful epilogue — and I’ll be very disappointed if it doesn’t make it in some form to the TV show. In it we are catapulted a hundred years into the future, to a time when Gilead no longer exists except in history books and the minds of academics. The brutal regime is discussed with lighthearted interest, as just a passing phase in the world’s past. It’s a powerful, bittersweet ending. We suddenly gain the glimmer of understanding we’ve been yearning for all along, that Offred’s fight was somehow worthwhile, a small pebble of the many hundreds that were thrown and eventually brought down the mighty state of Gilead. The academics have discovered Offred’s memoirs, preserved as tape recordings and transcripts, which they dub — of course — The Handmaid’s Tale. The book is defined by that masterful epilogue. Everything that occurs beforehand is put into perspective, fixed in a time and place, and all the turmoil that Offred experiences transmutes finally into the eponymous tale, half historical, half fictional, removed of power but none of the emotional resonance. I hope that the TV adaptation also manages to end in such a rewarding way. But of course it is its own entity, and as a dramatic show I feel it’s going to become less about the message Atwood was trying to communicate and more about the spectacle of the characters, the setting, of wondering what will happen next. I love a good drama as much as the next person, but I worry that such a formulaic pattern does weaken many potentially interesting concepts. It remains to be seen how the translation of The Handmaid’s Tale to our screens keeps the power of its themes alive when the tension must be strung out from episode to episode for however many series, and especially now it is veering on past the trajectory of the novel. For me The Handmaid’s Tale is a parable, a lesson, a story of power and greed and what can be done in its name. I love the show for the conviction it has in bringing its images to life in unflinching detail; for updating the story to fit our modern times; for showing us ever more dark and hypocritical sides to Gilead; and for the way it has created so many wonderful, exciting, complex characters beyond Offred. But this focus on character and world inevitably dilutes the impact of the core story and how it is told. For better or worse, that is the major difference between book and TV show. In the end it’s a testament to the pure potency of the story Atwood dreamt up that, even in this subdued form, it still has the ability to chill us to our very core.